Every once in a while, as the mood strikes me, I like to indulge in those titles that are a bit odd . . . a bit different . . . a bit bizarre . . . and a bit freaky. These are books that don't always get a lot of press, and which rarely benefit from any prominent retail shelf space. They're often an underground of sort of literature, best shared through guilty whispers, and often with embarrassed grins. These are our WTF Friday reads! Something a bit different this week. Donald has stopped by with a review of all but one of the stories in Blood Moon Rising (which is available for free from Smashwords & Kobo), and since that omitted story is one of his own, I've stepped in to cover his contribution and round out the review. 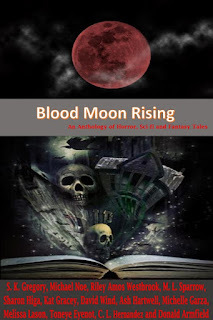 Blood Moon Rising is a mixed bag of tales that all take place under the blood moon. Revenge, rage, werewolves, bloody endings, and a harvest of authors come together to tell their tales...GREAT READ!! Blood Lust by S.K. Gregory: Revenge under the blood moon, the wolf come out to play. Under The Moon by Michael Noe: A reporter gets the actual scoop on werewolves. But its not the pen and pencil interview. A feast under the same moon as everyone else. Balls, A Man's Pride, A Woman's Best Weapon by Riley Amos Westbrook: The rage of a woman has got her man by the balls, literally. The Seventh Night by M.L. Sparrow: Powerful storytelling. Glowing eyes that watch from a decent. Moonlight and Murder by Sharon L. Higa - The investigation of Gi-row and a drug deal tainted in blood. Blood Rites by Kat Gracey: A power to die for or a power from deep within. Nice bloody ending. Tales Of Nevaeh by David Wind: A sci-fi blast far into the future. Earth is no longer and a voyage of many happenings. Night Time in the City by Ash Hartwell: The scent is to die for. The wolf is near around the corner or in the bushes. What is on the menu tonight under the Blood Moon. Blood Moon by Michelle Garza & Melissa Lason: The man who hunts for sexual pleasure becomes the hunted for a pack of werewolves. Hunter's Moon by Toneye Eyenot: The pack is eager for the hunt to begin. The Blood Moon is over head, Bon Appetite. Blood Moon over Modesto by C.L. Hernandez: A special brew for the druggies. The Blood Moon color has all the tweakers begging for more....or maybe? A Harvest Season by Donald Armfield: For a short poem of just 5 stanzas, this manages to tell a powerful tale that is literally dripping with dark imagery and sacrificial words. Thank for the kind words Bob.